Teddy Hermann 2018 NEW Club Member Pack, including Club Gift. Now the 19th year of the club. 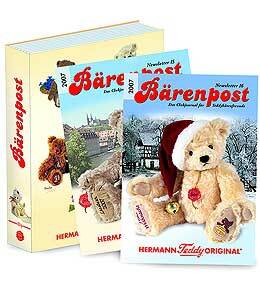 Twice a year, in April and October, you receive the Club Magazine, the 'Barenpost' with information about the bear-world of Teddy-Hermann, for example, the history of the Teddy-Hermann company, new products and Beary Events. Additionally, NEW members will receive Teddy-Hermann's A4 Magazine File, for the 'Barenpost'. Also when joining, a Yearly Club Gift is included. 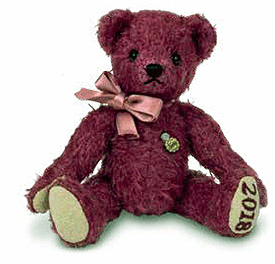 This year's is a 13cm, Fully jointed miniature Teddy Bear, handmade in cerise pink mohair wool. This comes individually boxed. Please Note: An Application form will be included to be completed by the New Member and returned back to us, here at Ashby Bears, so we can inform Teddy-Hermann only, who to send the New Club Membership card and Magazines to. 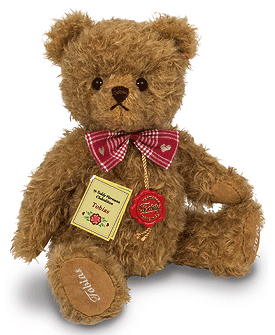 Teddy Hermann Club Edition 2018 Tobias Teddy Bear, wears a dark red bow tie and he's fully jointed and made of the finest soft brown Mohair. This wonderful item by Hermann Teddy Original is a special edition for 2018. His name Tobias will be embroidered on his right foot and the year 2018 on his left foot. The Teddy Hermann Collectors Club, BEAR ONLY for 2017 -2018 - 18th year of the club. A must have item for any Teddy Hermann collector. 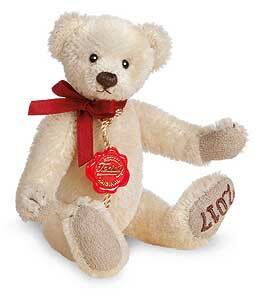 Teddy Hermann Lotta 2017 Club Edition Bear. 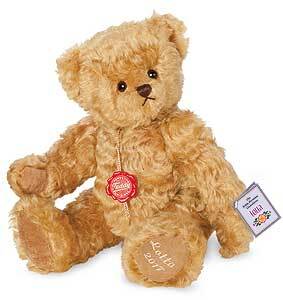 Fully jointed and made of the finest gold Mohair. This wonderful item by Hermann Teddy Original, is a limited edition of only 2017 production. Supplied Boxed with numbered certificate. Safety eyes, synthetic filling material, non growler, Mohair so surface washable only, size 28cm . ONLY 1 Now Left In STOCK! Being a member of the collectors club entitles you to a free copy of the club magazine "Barenpost", which is published twice a year. Also as a new member, you will receive a magazine file to store your Barenpost issues. You will also reveive a full set of Teddy Hermann Catalogues.